Guess Who’s Coming to Dinner? What’s It All About? If you have lived in Fort Lauderdale for a decade or two, you are familiar with the Opera Society’s Annual Fundraiser where locals hosted elaborate dinner parties for the benefit of the Opera Society. Today the Opera Society raises funds for Florida Grand Opera. It is just one of the many fundraising arms of Florida Grand Opera but its outreach to the community in Broward through the years is notable. 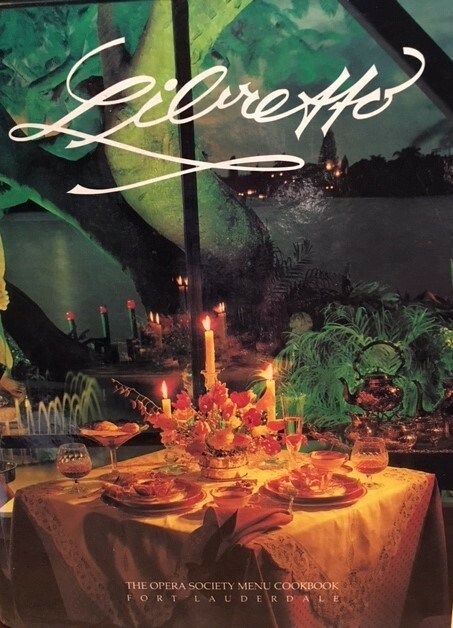 When the Opera Society published its Libretto Cookbook compiled of menus and recipes from members and hosts, the greater population throughout the Opera world noticed. It was shown at Opera America and Opera Volunteers International meetings for several years and it was featured in the Society pages and Food sections of several local papers. One of our hosts made the cover of Gold Coast Magazine. Her table setting and menu inside the magazine featured the cookbook cover designed by world famous photographer Peter Langone. Needless to say, after the cookbook was printed and launched by Neiman Marcus, there was some attention to the annual series and people wanted to know how they could get an invitation. Only Opera Society members were mailed the menu book invitation and the dinners filled up fast. Knowing that dinners were on a first come, first served basis, guests were asked to send their first, second, third and fourth choices if they were not able to get into the dinner of their choice. One year we had to limit the dinners you could attend to accommodate the membership. 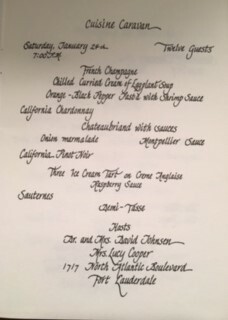 The early menu books featured between 15 to 20 dinners in private homes or on private yachts over a three-month period. 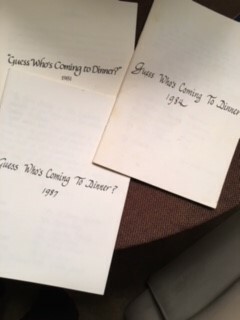 Opera Society President Marion Gamble launched the cookbook project in 1985. There were recipe gatherings and tastings and lots of typing. Marion asked me to chair the project as I had just completed the “Tuning Fork” cookbook for the Junior Symphony Guild. I was in my second year chairing the Guess Who’s Coming to Dinner event. “Opera Society hosts have come to South Florida from all over the globe. The Florida lifestyle lures people of all ethnic groups and this is reflected in the menus and recipes in this book,” said Marion Gamble in the book’s Introduction.